Although the major theme of the document Dominus Iesus, which was issued by the Congregation for the Doctrine of the Faith on Sept. 5, concerns the role of Christ and his church in the salvation of people who do not share Christian faith, the strongest reactions to it have come from spokespersons of the other Christian churches. In the view of many of them, this document has ignored or even negated the progress toward reconciliation that had been made in over 30 years of ecumenical dialogue. Although another document issued by the same congregation on June 30, with the title “Note on the Expression ‘sister Churches’,” will make the dialogue with the Orthodox more difficult than it has already proven to be, Dominus Iesus should not have a very negative effect with the Orthodox. In fact, Dominus Iesus has some remarkably positive points that seek to improve relations with the Orthodox. In its opening section, for example, it gives the text of the creed in its original form, that is, in the way the Orthodox recite it, without the words “and from the Son,” which were added about the Holy Spirit in the Creed by the Latin church in the ninth century. Another is that in Dominus Iesus the Orthodox communities are called “true particular churches”: an unusual use of “true” referring to any but the Catholic Church. On the other hand, in its recent documents the Congregation for the Doctrine of the Faith has made no effort to improve relations with the Anglicans and Protestants. In its “Note on the Expression ‘Sister Churches’,” it excluded the use of the term “sister churches” for ecclesial communities that have not preserved a valid episcopate and Eucharist. In Dominus Iesus it declared that such communities “are not churches in the proper sense.” Critical comments expressed by Anglicans and Protestants make it obvious that they take these statements as referring to their own churches. I presume that the officials of the C.D.F. would justify this language on the grounds that it is consistent with that of Vatican II. This raises two questions: whether in fact it is consistent with Vatican II, and whether the ecumenical progress that has been made since Vatican II would not call for the use of more positive language regarding the Anglican and Protestant communities. The dialogues have produced important documents, such as “Baptism, Eucharist and Ministry” (BEM) published in 1982 by the Faith and Order Commission, the final report on Eucharist, ministry and authority in the church of ARCIC I, and the “Joint Declaration on the Doctrine of Justification” of ARCIC II. To explain the language used at Vatican II, it is helpful to recall that the official Catholic doctrine prior to the council—as expressed, for instance, in the encyclical Mystici Corporis of Pius XII—was that the church of Christ is strictly and exclusively identified with the Catholic Church. This was still asserted in the first two drafts of Vatican II’s “Dogmatic Constitution on the Church,” which said flatly: “The church of Christ is the Catholic Church.” The observation made by a number of bishops that this exclusive identification was inconsistent with the acknowledged presence of elements of the church elsewhere led the council to the decision no longer to say that the church of Christ is the Catholic Church, but to say, rather, that it subsists in it. The intention clearly was to continue to make a positive statement about the Catholic Church, but without the negative implication that the previous doctrine of exclusive identity had regarding the other churches. However, the Theological Commission did not spell out in detail how the term “subsists in” was to be understood. At that time I criticized this statement by the C.D.F., noting that Vatican II had not said that outside the Catholic Church there exist only elements of the church, and that if that were what it had meant, it would hardly have been consistent with itself when it recognized that there were not only elements, but churches and ecclesial communities outside the Catholic Church. I also argued that the meaning of subsistit that best corresponds to its meaning in classical Latin, and to its context in the passage where it occurs, is “continues to exist.” I further argued that in light of the “Decree on Ecumenism,” one can conclude that the council meant to affirm that the church Christ founded continues to exist in the Catholic Church with a fullness of the means of grace and of unity that are not found in any other church. From these texts it is evident that the council judged the presence of “the genuine and total reality of the Eucharistic mystery” so essential to the full reality of the church that it preferred not to use the term “church” of communities that, “because of the lack of the sacrament of orders,” had not preserved the Eucharist. The council never specified which those communities were, but it was well known that Pope Leo XIII had declared Anglican orders invalid and that orders in most Protestant communities were not conferred by episcopal ordination in the historic apostolic succession, on which Catholics believe their validity to depend. It must not be overlooked that the communities that have their origin in the separation that took place in the West are not merely a sum or collection of individual Christians, but they are constituted by social ecclesiastical elements which they have preserved from our common patrimony, and which confer on them a truly ecclesial character. In these communities the one sole church of Christ is present, albeit imperfectly, in a way that is somewhat like its presence in particular churches, and by means of their ecclesiastical elements the church of Christ is in some way operative in them. Indeed, the elements of sanctification and truth present in the other Christian communities, in a degree which varies from one to the other, constitute the objective basis of the communion, albeit imperfect, which exists between them and the Catholic Church. To the extent that these elements are found in other Christian communities, the one church of Christ is effectively present in them” [emphasis added]. The recent document of the C.D.F. would give one the impression that the church of Christ is present and operative only in those that it calls “true particular churches.” The positive assessment of the other Christian communities expressed at Vatican II, and recently confirmed by Pope John Paul II in Ut Unum Sint, would surely have warranted a more positive appreciation of the ecclesial character of the Anglican and Protestant communities than one finds in Dominus Iesus. One way to arrive at a more positive appreciation would be to balance the one-sided emphasis that has been put on the question of the validity of ministry in those communities. This could be done by giving the proper emphasis to the evident fruitfulness of this ministry. Whatever deficiency there may be with regard to their orders, there can be no doubt about the life of grace and salvation that has been communicated for centuries through the preaching of the word of God and other Christian ministry in the Anglican and Protestant churches. 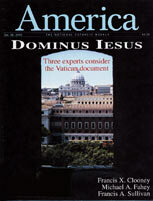 Bravo on the Oct. 28, 2000 issue and the three outstanding articles on Dominus Iesus—the most lucid and compelling comments on the subject I have yet to see. All three were indeed excellent. Father Clooney’s final paragraph quite beautifully captured the essential core. America has once again done signal service for God’s people. As I read with fascination in both America (10/28) and other journals how hierarchy and theologians struggle with the ripples (or tsunamis?) created by Dominus Iesus and cognate edicts, I cannot help but visualize an Oleg Cassini or an Yves St. Laurent trying to custom-tailor a ceremonial garment to the precise physical dimensions of the risen body of Jesus Christ, or even of the person of God’s Holy Spirit. Well, lots o’ luck! After all, isn’t the “people of God,” as described, if ever so haltingly, in Vatican II’s Lumen Gentium, ultimately a mystery, not much less unfathomable than the two just mentioned before? Perhaps the real mistake is not so much in definitions worded this way or that, but in the very insistence on defining (“making finite”) realities that are meant to prompt primarily not verbose dissections but profound awe and spiritual fascination—there being “different forms of service, but the same Lord”(1 Cor. 12:5). This article also appeared in print, under the headline "The Impact of Dominus Iesus on Ecumenism," in the October 28, 2000 issue. Francis A. Sullivan Francis A. Sullivan, S.J., is a professor of theology at Boston College, Chestnut Hill, Mass, and the author of Creative Fidelity.